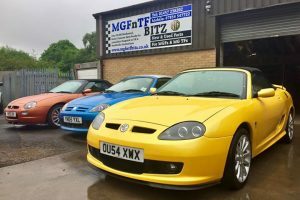 Based in Glossop, Derbyshire, we are a small family run business established 10 years ago through our passion for MG. We are a specialist supplier of quality new, used and reconditioned spare parts for your MGF or MG TF at affordable prices. Sourcing or manufacturing obsolete parts means we have very well stocked shelves of even the most difficult to find parts, all of which are carefully inspected and tested, ready for immediate dispatch Worldwide, with next day delivery to most of the UK. Work for us is like a hobby, new and used parts, sales cars, restoring customers cars, meeting and chatting with fellow enthusiasts, helping with technical advice, participating in convoy runs whilst raising money for charity…… we love it! Operating from modern premises with ample parking, we receive many compliments about how clean and tidy we are, and how efficiently the parts are stored and displayed. 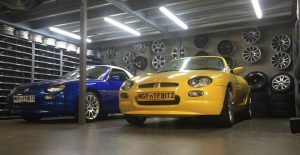 We are often being referred to as a ‘sweetie shop’ with our displays of brake upgrades, performance exhausts, wonderful array of refurbished alloy wheels, new mohair hoods, chrome, stainless steel and brightly coloured powder coated parts…… pay us a visit and see for yourself, whether it’s just to browse, obtain advice or join us for a coffee. We offer a free vehicle health check by appointment, where your car is thoroughly inspected from top to bottom, every bulb, joint, tyre etc is checked and a detailed report is provided on completion. 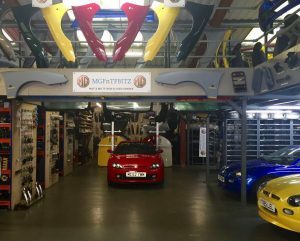 We carry out a range of work from servicing and MOT preparation to renovation works, subframe cleaning & painting, waxoyling or full subframe change if needed, some examples of which are in our renovations gallery.